What would make a perfect day for you? An easy work day? Dinner ready when you get home? A compliment on that flashy outfit you spontaneously picked up? How about a bouquet of daisies delivered right to your office? Well, UrbanStems, a flower delivery service, looks to help consumers share their immediate appreciation for that friend, colleague, or special someone by delivering sustainably sourced flowers to a designated location in just hours. Basing their service in metropolitan areas, UrbanStems looked to plant (pun intended) themselves in a new market – Philadelphia – and grow their roots in an already useful market for them – Washington, DC. Reaching their consumer target imposed a great deal of thought when trying to find ways of reaching them. 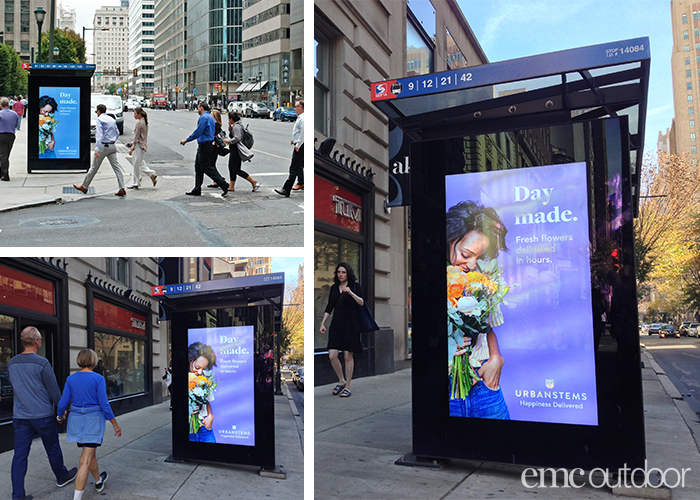 So, UrbanStems asked EMC Outdoor to help with their Out of Home marketing efforts. The goal was not only to raise awareness of their brand, but encourage same-day deliveries and provide that “making someone’s day” feeling. Who wouldn’t want to receive a fresh cut of tulips brought right to their office? The strategy involved reaching their urban audience within delivery zones and promoting their brand’s services. 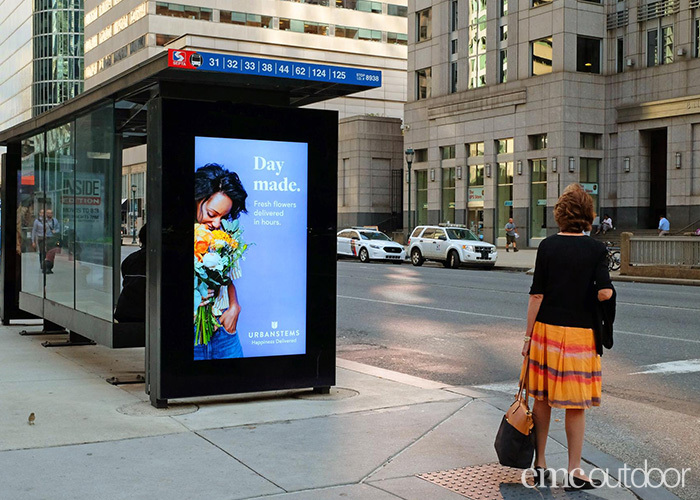 By utilizing transit shelters, rail stations and buses in the Philadelphia and Washington, DC markets, the transit media reached that niche urban, pedestrian-commuter market UrbanStems was trying to capture. 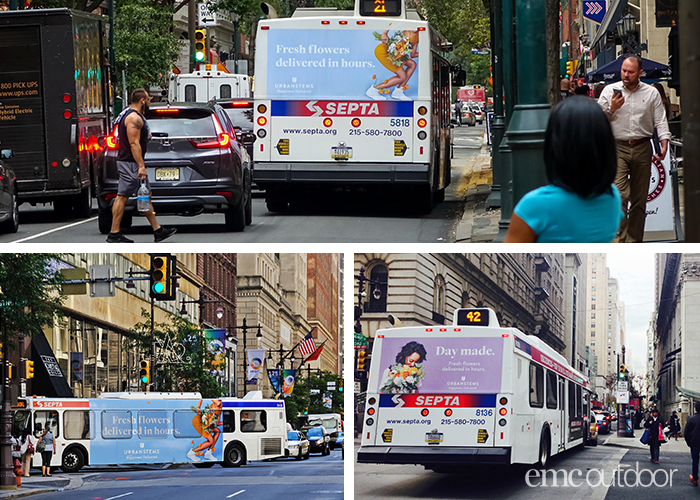 Strategic placement of transit media within busy working centers and weekend audiences, along with multiple vibrant and colorful creatives proved to reach customers within the designated areas UrbanStems operated in. The buses acted as eye-catching mobile billboards on busy urban corridors and key slow-moving roads. 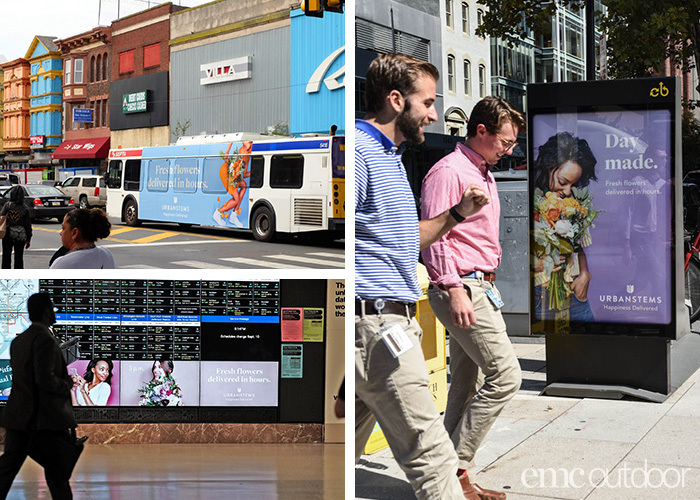 Digital subway entrances and street displays targeted an UrbanStems audience as they entered and exited transit hubs, along with those who walked to and from their businesses, favorite shops and restaurants, and homes. Digital walls at transit hubs targeted a commuting audience through a creative emphasizing delivery in hours and ease of ordering. In-car rail targeted a more affluent and captive commuting audience in DC. 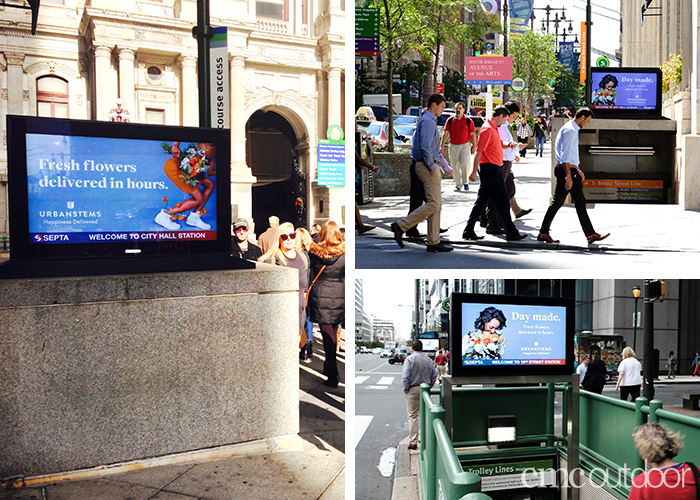 The transit shelters used in this campaign became a dual-purpose marketing tool with this UrbanStems campaign. None of the creatives faced inward towards those waiting for a bus – they faced outwards to target bustling pedestrian traffic, and served as a billboard for those passing by in cars. Buses added to the desired effect acting as mobile billboards circling around the specified target audience UrbanStems anticipated. As a result, EMC was able to help UrbanStems with Out of Home at two separate stages in the branding awareness pyramid – growth in a new market by highlighting the service’s capabilities, and continued growth and awareness in a market with previously found success. January 5, 2018 | Filed under Daily Updates.